Workflows are a notation for business processes, focusing on tasks and data flows between them. 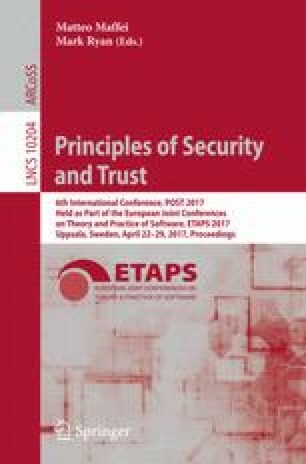 We have designed and implemented a method for analyzing leakages in workflows by combining differential privacy and mutual information. The input of the method is a description of leakages for each workflow component, using either differential-privacy- or mutual-information-based quantification (whichever is known for the component). The differential-privacy-based bounds are combined using the triangle inequality and are then converted to mutual-information-based bounds. Then the bounds for the components are combined using a maximum-flow algorithm. The output of the method is a mutual-information-based quantification of leakages of the whole workflow. This research was funded by the Air Force Research laboratory (AFRL) and Defense Advanced Research Projects Agency (DARPA) under contract FA8750-16-C-0011. The views expressed are those of the author(s) and do not reflect the official policy or position of the Department of Defense or the U.S. Government. This work has also been supported by Estonian Research Council, grant No. IUT27-1.